I was taught when I was a little boy that it was good to be unselfish and loving, and I used to think that I should grow up to serve other people. But after a while I found out that unless one has something to give people, there is nothing one can do to help them. Just because I thought I ought to help, it didn't mean that I had anything to give. Gradually, over the years, as I understood what it was that I had received of significance from the world, I realized that these things were never intended as gifts to be given in the usual sense of the word. However much one enjoys the song of birds, they are not singing for the advancement of music, and the clouds are not floating across the sky to be painted by artists. In the words of a Zen poem: The wild geese do not intend to cast their reflection; The water has no mind to retain their image. When a mountain stream flows out of a spring beside the road, and a thirsty traveler comes along and drinks deeply, the traveler is welcome. But the mountain stream is not waiting with the intention of refreshing thirsty travelers; it is just bubbling forth, and the travelers are always welcome to help themselves. So in exactly that sense I offer my ideas. The haiku of the reflection also teaches the lesson of non-attachment. Consider it the haiku of memories and thoughts: the brain has no mind to create thoughts and memories, the voice does not intend to convey any meaning. That was beautiful! A river that forgets its source will soon dry up. Just as the kind stream has a greater and kinder source-the mountain and its catchment area, I think that we should also realise our unfailing source of kindness to remain always kind. For me its is the Almighty God. Serving like a mountain stream: its always changing. Visit with 77 year old: biggest smile, happy to go to grocery shopping because it's an outing; smallest things matter. Service: so many problems, can do so little. compassion -- it's Latin roots mean sharing the pain without sharing the suffering. Busy doing good; you'll *just* get to heaven in next rebirth. A meditation teacher used to say Boddhisattva's have nothing to do, but they go out looking for trouble. You should be spiritual before you help. My friend would be disaapointed that he got only 80 people to donate blood that day. Dream: skinny boy, I want to help but no one was listening; next morning I was giant and just being could create a torando. Giving freely, without attachments, accounting. Service was never a thing to do. All streams go towards the ocean. Dalia Lama: "Be selfish. Be generous." Serving is actually the most selfish thing you can do. How can you eradicate poverty? I thought of NGOs. I went to Africa and saw that this model was broken; specific plans are limited. Visited 20-25 hospitals and none of them had sustainability plan. People need to change their mind, then everything will change. The more I teach, the more I learned. If you want to give, just give without attachment. Be natural. Analogy of stream reminds me of Wednesdays. We all carry a little bit into Thursdays and Friday. There's a dynamism to it, with apparent permanence because it's always there. I end up being lazy; sometimes, I'll just opportunities of service pass by. Howard Thurman once said, "Don't ask so much what the world needs; go out and do something that makes you come alive because what the world needs most are people who have come alive." Incorporate service into what makes you come alive. Flowing stream made me think about gratitude towards parents, teachers and friends. I felt humbled by their selfless help towards me. Running outdoors; was really hot; I stopped and looked up the enormous trees and saw how it is so constant. I appreciate the diversity in the room, and the perspectives I get on it. It's very easy to give to somebody who's close to you. Looking after a bonsai tree vs. looking after the forest. There's a danger of making the giving condescending. Giving is a way to absolve ways to atone for my sins at work where it is "kill or be killed". How do you deal with that contradiction? I can't remember a time when I gave. Is that ok? Rivers and clouds, examples in the quote, don't really have a choice. Humans aren't in that state of choicelessness. What can you really give? Time. That's the only thing in abundance. Ads shouldn't be in textbooks. On TV, you can turn it off. Then you will have teachers spending ten minutes talking about the commercials. To alleviate poverty, ultimately, helping people help people. The moment you make it big, it falls apart. Keyword here is unselfish. Act of giving can be selfish or unselfish. Teachers in India taught Algebra while selling vegetables. Simple things which I generally call "cute", I now see value in. Service can go in a religious direction, which can lose its essence, because the focus shift from the giver to the receiver. Service shouldn't be an emotional game; can't be evaluated soley by those metrics. Was in South Africa, was adopted by an old couple, and I was following them in the poorest province of the area. They wanted to touch my skin, because they've never seen yellow people. :) I was just "hanging out" but it helps me and the locals. Ego revels in accomplishment. Is service just a manifestion of that same ego? Sanksrit Verse gives thre role models of service: tree which takes the heat of the sun and gives shade without discrimination; flowing river goes as if it's own nature and while flowing it bends and purifies all who come across it; cows are the third example, even after its death its parts are used by all. Do what makes you come alive. Material poverty isn't really a metric to judge need by. Middle class neighborhood help is just as good as any. Service isn't something I talk about. I showed at 13 and doing little things, and it changed my life. My dog teaches me how to serve and be with others. We go to a quadrapelgic ward, some of whose patients don't get out. While serving be mindful of their motives. Giving water ... that's how my grandfather gave. They would sit down under their tree. I had the same thought a couple of months before I had a chance to meet him... "Giving up intent". "unselfish" word rings a good bell in my heart. This word seems to define a great act or great service. 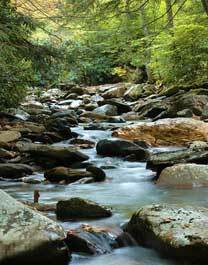 THe author gives many nice examples of mountain streams, songs of birds erc. Very refreshing...and clear...made me realize all the times that I strive to be something to all people. Doing good for sake of doing good is sooo different than doing good for sake of being loved or approved by others!!!! Just as a stream survives without intention, so a human can survive without belief. In being human one must practice just being there, not intenting nor believing one is fulfilling any purpose. Beliefs and intentions are created as barriers to being one's self. That's a beautiful thought. It's a reminder to me that everyone I meet is a teacher with a gift for me. Richard Bach in the book Illusions said "Be who you are.. calm, clear and bright". I believe that if we can just BE who we are we can touch others in a special way and we can also draw situations and people that are meant for us.